This Saturday, March 3, bring your family to share in the wonder of The Peking Acrobats. Since their debut in 1986, the Peking Acrobats have redefined audience perceptions of Chinese acrobatics. They perform daring maneuvers atop a precarious pagoda of chairs, are experts at treacherous wire-walking, and will astound with their trick-cycling, precision tumbling, somersaulting, gymnastics, and juggling. Their dexterity and incredible balancing feats showcase their tremendous skill and ability. These incredible performers are accompanied by live musicians playing traditional Chinese instruments. It’s an awe-inspiring entertainment event not to be missed! 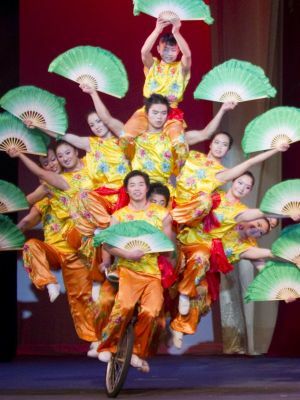 The Peking Acrobats – Saturday, March 3 at 3:00 & 7:30 p.m.